“What does it tell you to do?” Curcio asked at one point. “Burn. Kill. Destroy,” Cruz replied. He asked Curcio for a psychologist during the interrogation as he wanted to “find out what’s wrong with me.” When asked if he feared anything by not obeying the voice, Cruz said he didn’t want to be lonely, and without the voice, he had no one else. “So why do you want to be friends with somebody who just wants to tell you to do bad things?” Curcio asked. “To have somebody,” Cruz replied. “Because I have no one,” Cruz answered. “So you’d rather be in trouble than to be lonely?” Curcio asked. Curcio asked if the voice told him to buy the AR-15, and Cruz replied in the affirmative. “Was the voice helping you pick out the gun, or was it just you helping?” Curcio inquired. “Now, if the voice told you to buy … the AR-15, what do you think if you didn’t buy it? If you said, ‘Hey, I ain’t buying these guns; too expensive,’ what do you think the voice would have done to you? Just stopped talking to you?” Curcio asked moments later. “No. Tell me to hurt myself,” Cruz answered, advising that he already had been cutting himself for years. He said that the voice told him to do it, and that even during the interview, the voice was urging him to kill himself. Cruz repeatedly alternately referred to the voice as “the demon,” stating that wherever he went, the demon went with him. He said that the demon also picked out certain music to listen to, including German music and sad, suicidal music. Cruz said that he wanted to see a psychologist, but the voice told him not to. When asked why he never told his mother, Cruz said that he didn’t want to scare her. “What do you believe in?” Curcio asked. “I believe there’s something,” Cruz replied. “Okay. But if you believe in demons, do you believe in angels? Angels [are] the good. Demons are the bad. When you say the word demon, do you think it’s an evil spirit or what do you think it is?” Curcio inquired. “A voice. A demon voice,” Cruz answered. Cruz advised that he took Xanax and marijuana at least once to help make the voice go away. When Curcio asked why he didn’t get a prescription or just continue to take the drugs illegally to do something about the demon, Cruz said that he was scared to tell a doctor and he didn’t want to engage in illegal activity. Curcio then forthrightly stated that he believed that Cruz either liked the demon or made the story up. “I think you’re using the demon as an excuse,” Crucio contended. Read the transcript, which was redacted by authorities to black out any confession, in full here, and click here to view video footage of the interrogation. 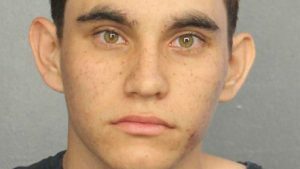 As previously reported, Cruz killed 17 people at Marjory Stoneman Douglas High School in February and wounded almost 20 others.